Trail Report: Monday, April 22, 2019. Spring has arrived!! You are welcome to enjoy our trails via hiking, but be prepared for muddy conditions. Enjoy hiking, biking, skiing, snowshoeing and wildlife watching along our 12-mile trail system. Our trails are OPEN TO EVERYONE, from dawn to dusk. The terrain is gentle and winds through the woods, along the lake, bog and nearby Manitowish River allowing you to explore a variety of habitats each with their own unique plants and animals. In the winter, trails are tracked for classic skiing, and we have snowshoes available for use. (In winter, leashed dogs allowed on snowshoe trail only.) Members may use the snowshoes for free, general public pay $5 per pair. April through October, enjoy our 22-Station Breeding Bird Trail. Signs are dispersed throughout the trail system, highlighting birds known to breed in or near that exact spot. Check a few of them out! November through April, depending on weather, you can hike, fat bike, snowshoe or XC ski. Give us a call for the most up to date trail conditions. 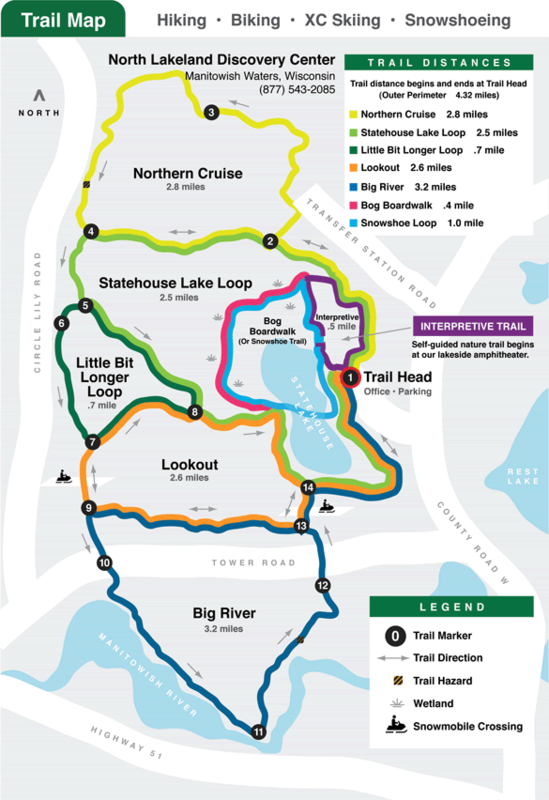 Your donation is needed and appreciated each time you use the Discovery Center trails.